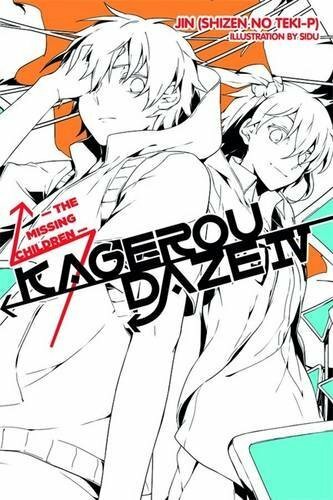 This review is for the fourth volume of Kagerou Daze by Jin (Shizen no Teki-P), featuring art by Sidu. The English edition was released by Yen Press in July 2016. In December 2018, the eighth and final volume of the series will release in English. There are a lot of light novel series I want to catch up on, and Kagerou Daze seemed as good a series as any to start with. The novels are short, easy, and enjoyable reads. I hardly ever see anyone talk about the series at all, which is a shame… These Mekakucity kids need more love! Volume 4 continues the trend of telling two stories, jumping back and forth between them from chapter to chapter. One story involves Shintaro, Kido, Konoha, and Mary going to the house in the middle of a forest that Mary once lived in, in hopes of uncovering some truth regarding their eye powers, Mary’s past, and “the other world.” What they find there is a diary, which constitutes the other story presented in this volume. The person who wrote this diary, it turns out, isn’t exactly human. Azami might just be my new favorite character for this series though. She’s got a pretty unique perspective on things, as far as light novels go. A powerful pipsqueak tsundere who talks to snakes and gets some random guy to build her a house, what’s not to love here. She has a cool character design (well, everyone in Kagerou Daze does, but still), and she’s gotta be at least a little evil, right? I want to be cool and evil too. And get some random guy to build me a house. Well, that’s that for that. I should also mention that this volume is also pretty great for how it plays with page formatting for its text and images. It’s the sort of fun and experimental thing you rarely see outside of light novels, and Kagerou Daze does some clever stuff to give certain scenes an extra-big impact. I also appreciated the appendix with its illustration sketches, as well as the very special bonus pages devoted to Mary’s childhood crayon drawings. Thank you for going that extra mile, Sidu! Those are some truly epic scribbles. Light novels. I love them!